Le Cache Euro 2400 Wine Cabinet Classic Cherry (P/N 746). 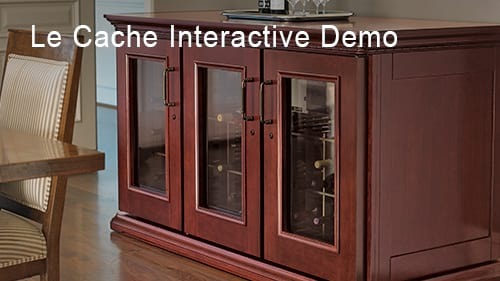 Designed by acclaimed, Pinnacle Award-winning designer Martin de Blois, our European Country Series wine cabinets evoke the timeless elegance of European furnishings. Architectural details such as crown and base molding, paneled sides, hardwood French doors and hand-carved accents showcase fine wine collections with a sense of luxury and style. Sealed seams, premium insulation and tinted double-paned glass provide thermal and UV protection.These options are included in the price of your wine cabinet. NOW EVEN QUIETER! The Euro 2400 is our most popular size wine cabinet, with hardwood French doors and storage capacity for 286 bottles. Great piece of furniture that holds plenty of bottles. Very quite and functional. I have had mine for five months now and has functioned perfectly. by John R. Johnson, D.V.M. Outstanding customer service both before and after the sale. Highest quality cabinet I could find for the price. My expectations were exceeded. Thank you. Our European Country 2400 was delivered looking even better than it appeared on the website. It is functioning in a quiet and unobtrusive manner even though it is located in our family room close to television and activities. and its cooling seems to be working in a very consistent temperature. If the wine bottles had faces. they would be smiling! We are. I love the wine refrig! Finally, good protection for my wine, and great looking piece of furniture in the living room too. Our cabinet arrived last Friday and it is quite stunning. The Le Cache Euro 2400 wine cabinet arrived in good condition and the tilt meter did not indicate any problems. The delivery company (Cardinal) was very professional and they completed the set-up as contracted....One key comment would be that when the cooling unit kicks on, it is a bit louder than I thought it would be but it is very similar but not any louder than our GE double door refrigerator in the kitchen, as the wine cabinet is positioned in our adjacent eat-in area. I had done extensive research on cooling units and reviewed your on-line data as to comparisons with other companies and warranties and found that the Le Cache cooling unit is apparently the quietest; it does cool down very quickly and efficiently; and it cuts-off quietly when it reaches the preset interior temperature of 55 degrees. At night, the blue LED temperature light is prevalent in a dark room and adds to the grandeur of the unit. So far, we are very happy with the Euro 2400 unit as we have only stocked it with half of its capacity at this time. What we have also been doing is when we have a bottle we do not want to finish right away, we reseal it with a vacuum pump and store it on the tilt presentment shelf insert as a reminder it is there; and so far, it keeps very well until needed the next day or so with no substantive loss of flavor or quality. Some other points as to your product are that the door and the cabinet did not need to be adjusted as it was square when received; the door seals are very airtight even though the doors are easy to open and close as needed; and the process for the installation of the sliders for the top and bottom molding was unique, effective and enhance the wine cabinet extremely well. We also complement Le Cache on this after-delivery request for feedback, as it is an indicator of a company striving to improve its product and you are customer focused.